Jana Komaritsa (aka Yana Ness) is a Russian-born multidisciplinary artist currently based in Saint Paul, Minnesota. She was born west of the Ural Mountains in Russia, where she was inspired by mountainous landscapes, picturesque river banks, and large forests home to a diverse wildlife. Years later, her family moved to Moscow, which opened opportunities that helped shape her artistic vision. Jana attended two schools of fine arts where she earned two diplomas with honors, and afterwards graduated with a Bachelor’s degree in Architecture, along with a specialized diploma in Architecture and Urban Planning from the Moscow Architecture Academy. In 2010, Jana moved to Germany and continued her academic career at Stuttgart University where she earned a Master’s degree in Infrastructure planning, extending her knowledge of urbanism. In 2013 Jana moved to the USA, where she founded her art and crafts studio. Jana always tries to find ways to blend a variety of techniques and methods, and always leave room for developing new skills. Today, she explores her artistic voice through Purr Party, creating meaningful pet portraits inspired by her cat. She also works in music and performance with her project Darkrad and was released on labels in Germany and Sweden. See Jana's work at the upcoming Maker Faire MSP at the MN State Fairgrounds Grandstand on June 2, 2018. This event serves as a gathering of fascinating, curious people who enjoy learning and who love sharing what they can do. From engineers to artists to scientists to crafters, Maker Faire is a venue for these "makers" to share their hobbies, experiments, and projects. More details about the show here! Growing up near the Ural Mountains in Russia amongst rivers and forests and mountains and diverse wildlife, how did that early connection to nature impact your childhood and creativity? From my early years, I was inspired by the surrounding environment and have developed love for animals and nature. Sometimes we forget our deep connection to nature in our highly technological world. But when the volcano erupts or the severe storms form at the coasts, it appears that we don’t have the technology to withstand the might of nature. Sometimes we don’t realize that our world might be the only one we have. In my artistic endeavors I strongly feel the connection to nature. It was seeded in me from my early years and through my life it was growing, like a tree, to expand the bushes, to bloom the flowers, to open myself to the world around me, to the serene beautiful world and discover my place in the eternal circle of life. Throughout your lifetime, what forms or channels have you explored in your creative journey? I grew up in a family that strongly appreciated arts. I started painting in childhood, attended two art schools, graduated both with diplomas with honors; I have degrees in architecture and urban planning. I was working as an architect, interior designer and later as urban planner. I enjoy doing fine and visual arts, painting, drawing… I work in a variety of mediums and create pictures mostly melancholic in atmosphere, sometimes dark, sometimes mystical. My other project is animal and pet painting – Purr Party. It was inspired by my cat. 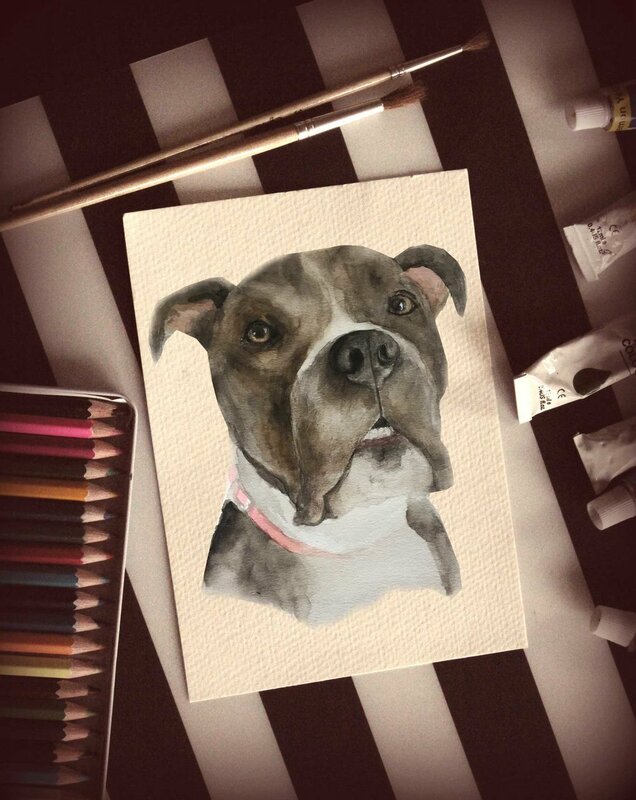 I make custom pet portraits and jewelry. In the world of music I do DJing and I also compose and have my own music and performance project Darkrad which is a combination of sounds, visuals and body performance. This project is inspired a lot by my acting in the theatre in the past. Last but not the least; I started working on my new jewelry line. It will be geometrical experimental jewelry, better say wearable art. The routes of these designs go back to my architecture work. I was always surrounded by art and I’ve been very active in the art and music scene, in my home country and abroad. I never imagined myself without this opportunity to express myself in these various forms of arts. 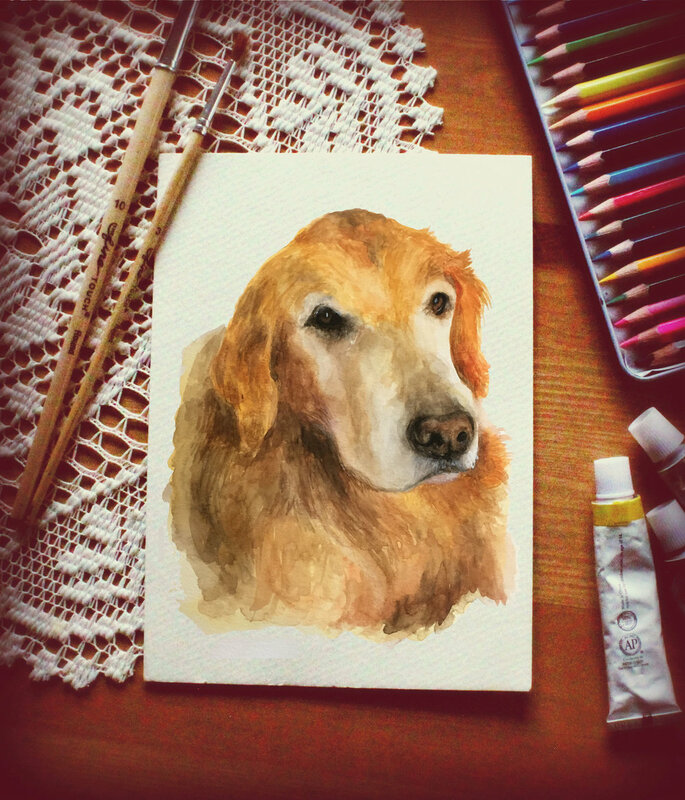 What do you find interesting/meaningful about painting portraits of pets? My pet painting project grew out of the three pictures I painted of my cat and his friends: two other cats, with which he played outside. I started experimenting a lot with watercolor animal painting and it just felt very pleasant and calming. It was somewhat a safe haven for me to escape from the madness of the world. It then grew into a small business and an online shop. I started experimenting with various materials… I consider pets to be a part of a family. It feels so right to see the reaction of pet owners, whose furry friends I’ve painted. They feel so happy! It makes me happy too! What does your artistic process look like from start to finish? It really depends on what kind of art I do. Most of the time, it’s very emotional and expressive. When I capture the idea, see image in my head or hear the melody, it’s often very important to get to work right away, not to lose this vibe. But I also make a lot of notes, to capture these ideas and come back to them in the future. I don’t do much sketching, I start with the blank canvas and it’s all in my head. Sometimes it turns out completely different from what I have planned, but why not? What role does experimentation play in your work? I experiment a lot. Sometimes I get carried away so easily by new and interesting things which feed my curiosity! But nevertheless I try to stay on one track and every now and then have to limit my work to certain materials. Most of my creative work is pretty experimental, starting from music and finishing with jewelry. My classical training in fine arts and architecture helps me to understand the composition, form, shape, techniques, but the idea itself is most of the time pretty experimental. Having lived in Russia, Germany, and now, America, do you feel connected to Minnesota? How does the Minnesota arts community compare to other arts communities you've experienced around the world? I lived in different parts of the world and I also travelled a lot. It helps me to think “outside of the box” in various spheres of life and to appreciate and understand different cultures and mentalities. Last but not the least; it helps me to understand myself. When I moved to the States 4.5 years ago, I moved to my husband in North Dakota. I’ve spent 4 years there, in the peak of the oil boom, but also amongst the beautiful outdoors, where I enjoyed bird and wildlife watching, accompanying my husband on hunting trips, spending weekends at the farm away from civilization, waking up to sounds of the rain and the hooting of the owls. Now we live in St. Paul and I’m happy to be back in the city again and have diversity in my life. I enjoy the vibrant city life and the gorgeous nature of Minnesota. The art community here is thriving! I didn’t know what to expect at the beginning, but only after a few months, I was already an active participant in the local community, taking part in various events and showcasing my art and music. I feel that there’s a strong support for arts here. When I lived in Germany, I was actively engaged in the European art and music scene. I played concerts all over Germany and Europe. The most thriving art scene in Germany is Berlin. It attracts artists from all over the world. Moscow is developing rapidly. My artistic and musical career started there at full speed. As a huge metropolis, it has a lot to offer. A lot of artist spaces and lofts pop up in former industrial buildings. This trend for revitalization of industrial areas, which started in Moscow, reminds me of Twin cities, where you can find a lot of industrial sites, occupied by artists. My business is only one part of me. I work on several projects and even though these projects are quite diverse in nature, they are all coming from my heart. It is very important for me to reach my audience. I want to open myself and let others have a look what’s there inside me, I want us to communicate and interact on these various artistic levels. Even though I work on an international level and have presence in several countries, I want my art to be also beneficial to the community where I live: the community of St. Paul, Minneapolis and the area. I started teaching art classes as well, as I feel the need to pass on the knowledge I have.